While deployed in the Philippines, HM1 Herman displayed extraordinary heroism while tending to multiple host nation casualties with injuries including a gun shot wound to the cranium, torso and another with multiple gun shot wounds to their arm along with an open fracture blast injury to the lower leg. During stabilization of the casualties, HM1 Herman hastily took control of the situation by successfully establishing a definitive cricothyroid airway and conducting tubal thoracotomy for two of the critically injured patients. 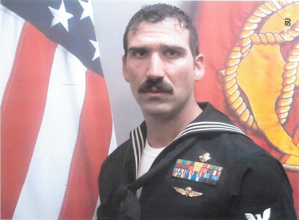 Petty Officer Herman's exemplary medical abilities and competent demeanor saved the lives of all causalities that day. ASYMCA is proud to honor Hospital Corpsman First Class Aaron J. Herman for his extraordinarily heroic actions.